The stone circles in Britain, Ireland and the Continent are probably the most basic forms of quadralectic architecture, although it is never interpreted in that way. The megalithic buildings have attracted a constant stream of attention, and it is certainly true when Jacquetta Hawkes (1967) remarked that ‘Every age has the Stonehenge it desires – or deserves’. Aubrey BURL (1999, p. 9) added to this quotation the saying that ‘for generations these chronological chameleons have provided a challenge for the serious enquirer and simultaneously a paradise for the escapist.’ For this very reason one is reluctant to add another theory to the existing list, but the subject is too important to leave it out of the history of quadralectic architecture. Aubrey Burl distinguished four distinct groups of visitors to the stone circles, ‘three of them earnest in their inquiries, the fourth a cheerful though perplexed company of tourists’. His distinction (of types of observers) fits perfectly well into the quadralectic pattern of visibilities in the various quadrants-as-ways-of-observation. 1. The ‘cheerful though perplexed tourists’ belong to a stage in the communication without ‘knowledge’, with only a vague and non-directed interest. They don’t see the ‘real’ thing, but still come by the busloads. Burl qualifies this group indirectly as not ‘earnest’. This characterization is questionable, because this group is just as important in the encounter with the stone circles as other visitors are. The lack of knowledge and distinction would place these spectators in a quadralectic interpretation in the First Quadrant, the realm of the invisible invisibility. 2. The Scientific-Investigative type of visitor can be positioned in the Second Quadrant. This person often is a demographer or mathematician, who visit the site with certain, often preconceived, ideas, which must be verified in the field. Or better still: the scientist develops new ideas from the field observations. The emphasis is mainly on measurements, alignments and numeracy to support a scientific foundation. 3. The third type of visitor is the archaeologist, who belongs – in the present qualification – to the Third Quadrant. The archaeologist sticks to the facts and ‘often refuse to speculate’. It is only the visible visibility of megaliths and artifacts that count, not the possible use or function. The circle is dehumanized and the past – although scientifically correct – looks dull and matter-of-fact. It is only when our (present) imagination – bestowed with the tribulations of real people – is set at work that history becomes alive and kicking. 4. The last type of visitor, according to Burl, is the Subjective-Emotional type, which can be placed in the Fourth Quadrant. These explorers dowse with rods, dangle pendulums over stones and mark ley-lines on maps to prove some magical intentions of the original builders and find ‘centers of spiritual emanations’. The scientific community often regards their results and speculations as, at best, out-of-order or, in most cases, totally ridiculous. The quadralectic principles leave these investigators in their own right, knowing that the subjective-emotional approach is an essential part of any investigation, scientific or non-scientific alike. Most (present) researchers are convinced that some sort of ritual must have taken place in which the stone circles played a central role. The time of their foundations – from the Late Neolithic period (3000 BC) up into the Bronze Age (1500 BC) – has left no records of their actual use and therefore, speculations have to come in order to explain their existence. And that is where Hawkes statement comes into view. A speculation is a subjective matter, which is bound to a particular position in an ongoing communication between the observer and the observed. The most popular interpretation of the stone circles – at present – is their function as an indicator for certain cosmic events (DROSSLER, 1990). The features have a ‘cosmic’ significance. Modern investigators put a special emphasis on Time (events in time). Their conclusions are often readily accepted by the greater public, which likes the ‘mysteries’ of incredible and unimaginable achievements of prehistoric human beings. This direction of research will not completely be dismissed, but a suggestion will be made here to place the enigmatic megalithic structures in another light. The emphasis on Time (and the prediction of events) should be diminished and replaced by an emphasis on Place (the position of the observer). Maybe there was no ‘astronomy in stones’ at all, but just a more or less spiritual event not unlike the actions taking place in temples, cathedrals and churches throughout the ages. This communal, ‘religious’ aspect could explain the enormous efforts made by the local people to collect the megaliths with primitive means. The occurrences of stone circles cover the greater part of Europe. Great boulders were left in areas where the latest Ice Age retreated or could be found in ancient quarries. They range from the occurrences in Sleeswijk Holstein (Germany, like the circle of Boitin, thirty kilometers east of Schwerin, Mecklenburg-Vorpommern), and throughout central Europe, with a concentration in Great Britain, Ireland and Western France (fig. 54). Fig. 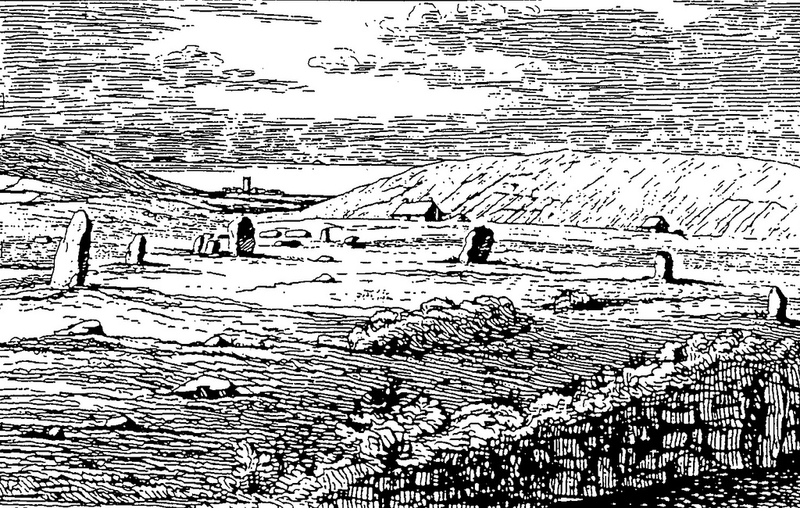 54 – The stone circle of Tregeseal Centre (Cornwall) on the Lands End peninsula as it was depicted on an etching by Rev. W. Cotton in 1826. This stone circle, which is now destroyed, is as one of the many examples of stone circles on the British Isles. Many of the megaliths are standing today, like the famous Land’s End stone circles of Boscawen-Un and Men-An-Tol, the latter with a large circular stone with a hole. The site of the Merry Maidens, south of the village of St Buryan (Cornwall), was visited by the author in 2013. The stone circle in its most basic form is called a ‘four-poster’, many of which can be found in northeastern Scotland (BURL, 1988). They are characterized by four (standing) stones within a cyclic enclosure (fig. 55). Fig. 55 – The so-called ’four-poster’ is the most elementary form of a stone circle. This example is the Na Carraigean (Editian) near Blair Athol, Scotland and drawn by Coles in 1908. An alternative name is Na Clachan Aoraidh, meaning ‘the stones of worship’. The four (standing) stones are often (but not always) directed towards the directions of the winds. They act, in the present quadralectic interpretation, as the ‘measuring stones’ to calculate a certain position in a communication (with the gods or in one’s own life). The elements of the four posters can also be recognized in the architecture of the famous stone circles at Stonehenge, north of Salisbury, England. This Neolithic monument could be regarded as the most remarkable piece of quadralectic architecture. A lot of nonsense has been written over the years with regards to this monument, but it cannot be denied that certain quadralectic principles are noticeable in its outlay. These principles have nothing to do with astronomical alignments or other calendrical functions. The emphasis should be laid on the consciousness of place within the context of a universal communication. Three Periods were distinguished during research in the nineteen fifties (ATKINSON, 1956). The First Period (Stonehenge I) started around 3500 BC with the construction of a circular bank. Fifty-six holes, possibly with wooden posts – the so-called Aubrey holes – mark the circle. Very few stones were placed during this stage, with the possible exception of the four Station Stones (two of which are still present). The fact that they are not graded or dressed in any way could indicate their early date and even the possibility of their importation from an older ceremonial place. Other investigators place the Station Stones in the Second Period as part of the major development program of that era. 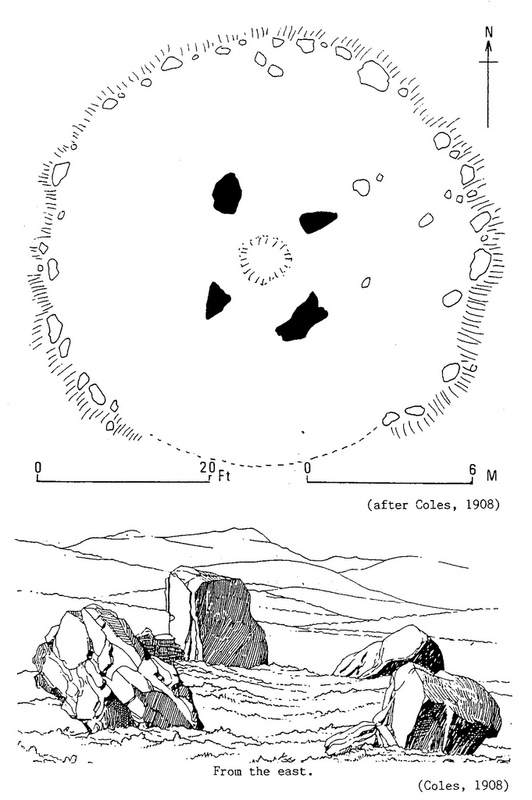 The Station Stones presented the crucial evidence in the observational theory as developed by Alexander Thom and others (fig. 56). Fig. 56 – The architectural features at Stonehenge, England. 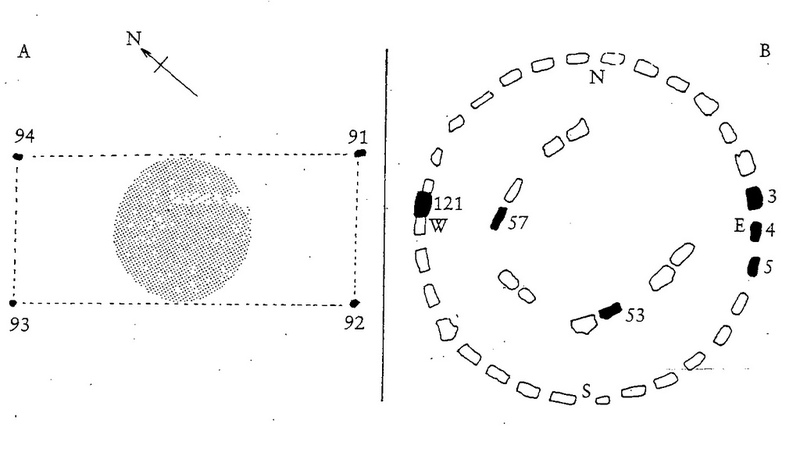 A (left): The Station Stones (SS 91 – 94) form a perfect rectangle with a NW – SE orientation around the sarsen ring. A north eastern view along the lines formed by the Station Stones 93 – 94 and 92 – 91 would give the place of sunrise at the horizon at the summer solstice (the longest day). The Sarsen ring, which was later added, fitted into this rectangle. B (right): The sarsen horseshoe of trilitons inside the circle. The decorated stones are indicated in black. The Second Period from 2700 – 2000 BC (other sources, like HAWKINS (1966; 1973) mention younger dates of 2550 – 1700 BC) saw an increase in building activities. 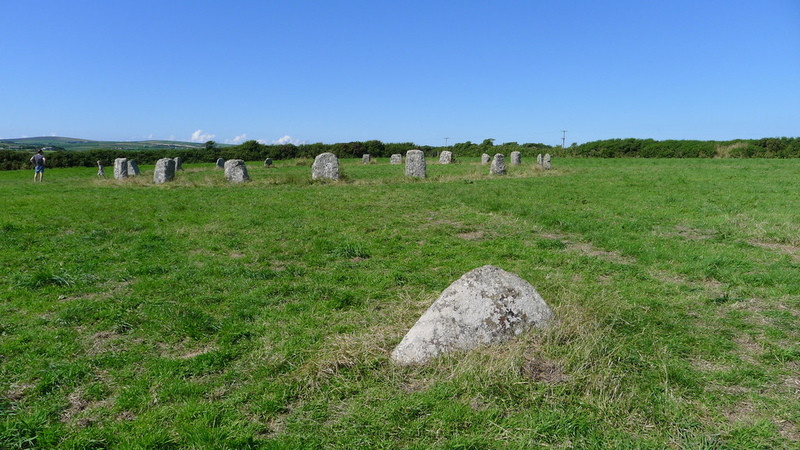 Another two rings of menhirs were put in place (the Bluestones, including the Altar Stone). About eighty of them were erected in the center of the site in two concentric circles. This double circle of bluestones, which was never completed, was dismantled in the following period. Most of the large stones were erected at the beginning of the Third Period (Stonehenge IIIa) starting from 2100 BC until 1500 BC. The transportation and positioning of the Sarsen Circle and the grand horseshoe of Trilithons were engineering successes in their own right. The Heel Stone was placed at the open end of the horseshoe of the five trilithons, some thirty-five meters from the ring. The sun will rise on the summer solstice (longest day) in alignment with the heel stone as seen from the center of the ring. The entrance road along this alignment is called the Avenue. The beginnings of the Third Period (Stonehenge III) were the heyday of Stonehenge as a place of ritual celebration (as a ‘temple’). It was only after until 1400 BC that decline and abandonment took place, when the Wessex people populated the area. The Avenue was extended in 1100 BC indicating that the place was still more or less functional. The site is still shrouded in all sorts of mysteries. The motive of construction has now shifted from an emphasis of the theological and spiritual (‘a religion with a lost creed’) to the ‘astronomical’. Sunrises were measured, alignments suggested, plans were drawn (Inigo Jones’ seventeenth century plan (1625/1655) had a hexagonal layout!) and redrawn and fallen stones were lifted. The result is a checkered history and a sparkling affirmation of Hawkes’ saying that ‘Every age has the Stonehenge it desires – or deserves’. So, given this fact, it is fair to assume that a quadralectic time will have a quadralectic Stonehenge. A proposition will be made here. The stone circles can be seen as a universal means of worship and orientation in the widest sense. The stone circle (and possibly also the enigmatic elongated rows of stones in Brittany) is an ancient measure of communication. Not an astronomical clock (highlighting some cosmic event), not a compass (to give a linear direction in space), but a real item for measuring the human mind in its interaction with the surrounding (fig. 57). Fig. 57 – A hypothetical stone circle (black dots) is given here as a place of terrestrial communication and orientation. A location outside the circle can be validated by adding up the sequence number along a line of sight (the intermittent lines). The upper four poster (A), with a clockwise numbering 1 – 4, gives a ‘valuation-sequence’ of 3-7-4-5-5-6-7-3-4-5-5-6. 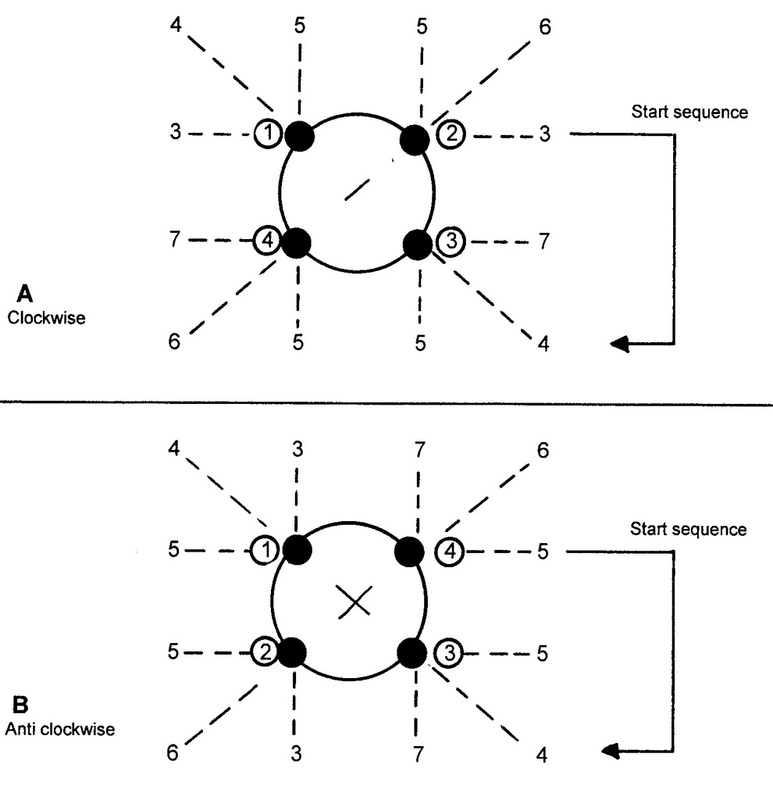 An anticlock-wise counting of the lower four poster (B) would result in the sum- figures of 5-5-4-7-3-6-5-5-4-3-7-6. Orientations in time (including predictions) can be part of the project, but it is likely that knowledge of the here and now in day-to-day life was far more important for the prehistoric man. Since there is no evidence of a particular kind of sun worship or any other type of worship, for that matter, it is safer to assume that our forebearers had the same basic spiritual needs as we have today. That is to say: that we like to know our place in the universe, that we like to put our position in perspective and that our efforts can be measured, in one way or another. It is only then, after valuation, that an evaluation of our being – as a human being – can take place. Temples and churches always have provided the ancient believers with the shelter for individual and/or collective search for meaning. However, they are often the architectonic representation of protection and not the mechanism of searching itself. The old stone circles, in their ‘primitive’ context, might have just that purpose. Not the building – the bricks – is important, but the dynamic action to collect building material in a collective effort to understand the meaning of life. And then, after the colossal stones had found their place in the natural environment again, they were used to bridge the gap between an endless space and the human presence therein. The cumulative value of the monoliths as the result of a particular line of vision could have been used as guidance in life or answer questions in relation to communication in general. ‘Large projects’ in a society should not be underestimated. Every cultural presence has the urge to put its marks in history and show its material power – and every historian is grateful for this fact. The quadralectic interpretation of the function of stone circles in ancient worship as indicators of a certain ‘communication’ value does away with the more obscure ‘cosmic’ speculations. Why would the Bronze Age man be interested any more than a present observer in the moment of sunrise on a particular day? There is little evidence of a sun worship in other occasions, so why bother about the spring solstice? It seems more likely that the ancient ‘believer’ was mostly concerned with his or her position in this world. The cyclic way of thinking – which is quite natural in the geographical areas away from the equator with their distinct climatological seasons – offers a dynamic approach to reality in contrast to the linear thoughts of our present cultural setting. The circular movement, with its fixed distance from the center and its possibility of return, is much more suitable for the awareness of a shift and subsequent valuation than the linear movement into infinity.